YUMMMMM-OOOOOO!!! I've had these and this recipe is the best. Looks so good. My mouth was watering as I read this post! YUM! Will you stop some by my house when you remake them? Yum-o. I'm too big and pregnant to make them myself. Rachel!!!! I am trying to count calories and just reading this made my calories go up for the day! What a wonderful wife you are! How did his coworkers like them? Ranting and raving I bet....how can you not...just look at them...yummy! I have this friend who for years has made cinnamon rolls every Thursday morning for her family. I have always said that I wanted to start that tradition...I have known her for 11 years and I have not started that yet...hahaha I think working with yeast intimidates me! They look so yummy. I love the frame you have around the first pic. Thanks for sharing the recipe. Yum, I LOVE HM cinnamon rolls. I haven't found the "best" recipe yet so I think I will give these a whirl this week :-) Thanks for the recipe. 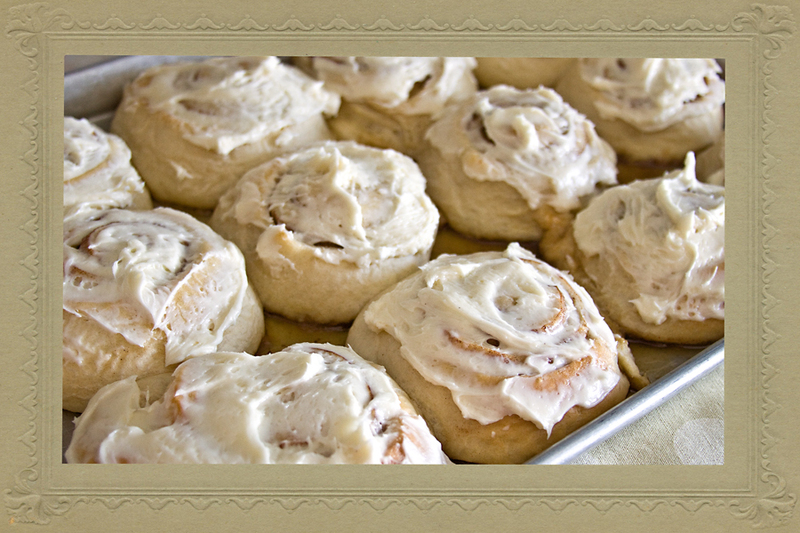 I have a weakness for cinnamon rolls, but I eat every single one of them! Maybe I can gain some self control and try these! Tried making these the other morning and failed.. HORRIBLY! :( I think I used the wrong kind of yeast.. What kind did you use? Have you ever tried The Pioneer Woman's recipe? SO easy! 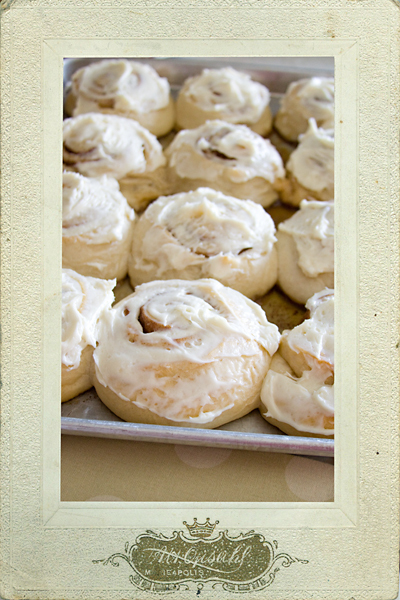 I like your frosting recipe, I add cream cheese to mine, mmmmmm...I just might have to make some tomorrow!